Given the tendency for many well established major players in the British art scene to operate from fairly modest sized spaces (such as the ‘Marlborough Gallery’ in central west London who deal with famous painters such as Lucien Freud and Frank Auerbach), the term ‘small gallery’ can really be applied for two different reasons: either applied to a gallery that is well established, but may otherwise be overlooked due to it’s size, or a gallery that is well worth a look, but is not well recognised. 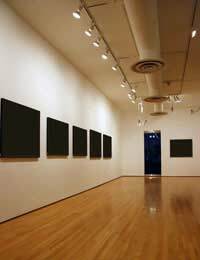 Another term, often applied, is 'independent gallery' and this denotes that the gallery does not receive either state or corporate funding, but runs on its own, following its own agenda. The sole reason for giving these smaller galleries a mention is that as a collector starting out, they will provide an invaluable source of information and artworks. Whilst knowledge of larger galleries is essential to a full enjoyment of the arts, knowledge of smaller galleries will enable you to keep one ear close to the ground with a view to the developing arts scene. Though there are exceptions to the rules, the London art scene revolves around two main areas – central West London and East London. Traditionally central West London has played host to both galleries dealing in antiquities and modern art works. However, the high cost of gallery space in west London saw the art scene migrate to the East End in the 1990s. Now, East London is the first port of call for people looking for small galleries, either with a portfolio of well established artists (such as the White Cube and Victoria Miro), a propensity to promote developing artists, or a mixture of both. A journey to wither Bond Street and the surrounding area (in West London) or Old Street/Hoxton) and the locality will open you up to a hundred or more galleries in total. If you find one gallery you should be able to pick up information as to the location of others: ‘New Contemporaries’ print a free monthly hand out with details of London gallery events and openings. It is well worth checking these out and taking the opportunity to attend ‘Private Views’ (first night openings) of exhibitions, which are often listed – these are a great place to meet both artists, gallery owners and curators. Whilst London galleries can largely be divided in to those in the West and those in the East, this merely points to the high concentration of galleries in these areas – there are, in fact galleries of some description in most areas of London, with South London (Peckham, New Cross and Camberwell areas) currently making a bid to become ‘the new East’! Though there is reportedly a higher concentration of artists in London than anywhere else in the world, there are undoubtedly a huge number of small and independent galleries in cities, towns and villages throughout the U.K. It would be labouring the point, perhaps, to point out that most towns have at least one small gallery. Establishing links with local galleries should be relatively easily, but be aware that there are some that will sell good marketable products, but that have no real standing in the art scene, and others that procure and sell works of genuine worth, with real investment potential. Depending on what you are after, it is worth considering where you shop.